Your business is all about saving lives. That includes having the best trained staff and most current technology and equipment to ensure both the fastest response times and the best patient outcomes. But, as you know, there’s so much more that goes into maintaining the highest quality of care – even down to the seemingly smallest detail, like keeping medications within their ideal temperature range. 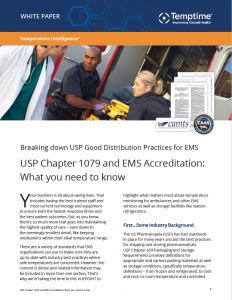 There are a variety of standards that EMS organizations can use to make sure they are up-to-date with industry best practices where safe temperatures are concerned. However, the content is dense and related information may be included in more than one section. That’s why we’re taking the time in this VUEPOINT to highlight what matters most about temperature monitoring for ambulances and other EMS vehicles as well as storage facilities like station refrigerators. The US Pharmacopeia (USP) has had standards in place for many years around the best practices for shipping and storing pharmaceuticals. USP Chapter 659 Packaging and Storage Requirements provides definitions for appropriate and various packing materials as well as storage conditions, specifically temperature definitions – from frozen and refrigerated, to cold and cool, to room temperature and controlled room temperature. There is also information related to allowable temperature excursions and how best to measure and track temperature, all meant to protect the integrity of drugs as well as ensure patient safety. More recently, as the industry has been working toward Good Distribution Practices – the USP updated their guidelines to include Chapter 1079 Good Storage and Distribution Practices for Drug Products. This informational chapter builds on the definitions provided in the earlier Chapter 659 and is used as guidance for all organizations and individuals involved in any aspect of the storage and distribution of all drug products, including Emergency Medical Services. Cabin temperatures must be measured and documented every 15 minutes during a patient transport until temperatures are maintained within the range of 50-95 degrees F (10-35 degrees C) for aircraft and range of 68-78 degrees F (20-25.5 degrees C) for ground vehicles. Thermometer is to be mounted inside the cabin. The program has written policies that address measures to be taken to avoid adverse effects of temperature extremes on patients and personnel on board. In the event cabin temperatures are less than 50 degrees F or greater than 95 degrees F, the program will require documentation be red flagged for the QM process to evaluate what measures were taken to mitigate adverse effects on the patient and crew and what outcomes resulted. In general terms, the standards do not specifically define extreme temperatures, which is why it’s important to understand the guidelines outlined in USP Chapter 659 and what is considered extreme temperatures. It also means EMS providers need to have processes in place that reliably monitor temperature. An electronic monitoring device that records temperature throughout storage is the preferred method for determining if medications or IV fluids and blood product have been exposed to extreme temperatures. An electronic monitoring device is also useful in monitoring cabin temperature, as described in the CAMTS standards. In a manual environment, personnel would need to look at the thermometer and write down the temperature in 15-minute increments – a process that’s highly prone to human error and uses valuable time, especially in emergency situations. Using an electronic monitoring device, the temperature is recorded continuously, and data can be easily downloaded, stored in the cloud and accessed via a web portal on-demand. 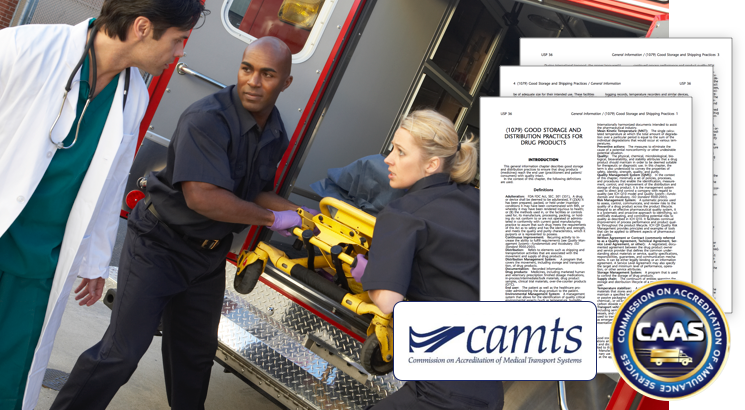 You can access the full set of standards at http://www.caas.org and https://www.camts.org, and the USP Guidelines at http://www.usp.org/. Learn more about the EDGE products and EMS medication temperature monitoring.